FAQ — Reality, Virtually, Hackathon! If I didn't come to the Team Formation on Friday, what should I do? We suggest you network with existing teams that interest you, in person, on slack and/or on the facebook page. Please be sure the team lead of the team you joined adds you to the team on Devpost. Where can I borrow devices? 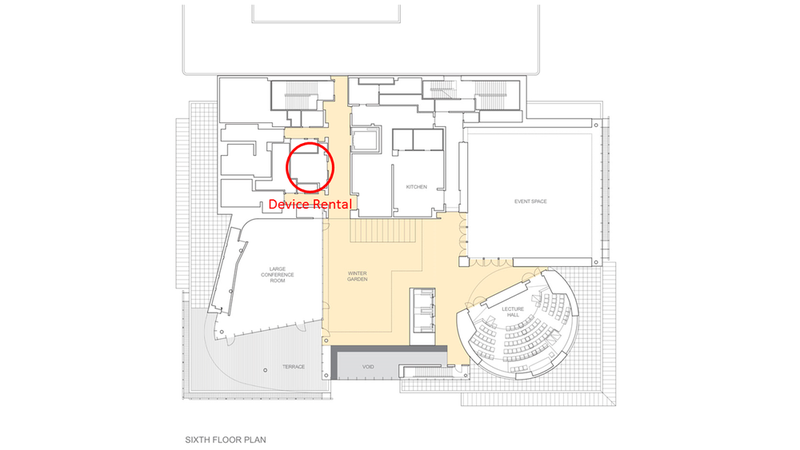 It is located in the room near restroom at the end of hallway on sixth floor of the Media (see map). Most devices (Oculus, Holo Lens, etc.) are currently allocated to each team. We still provide HDMI cables, Note 8 phones and Tripods. Device rental is “first come first serve” basis throughout the hackathon. Is there any printing service at the hackathon? Unfortunately we do not offer printing service in the building. Please resort to digital alternatives for projects. Not the entire Media Lab is available for hacking. Here are the places that you can work: E14-514b; E14-493 - Shared Vive plus one team bringing their own Vive; E14-393; E14-240 - Shared Vive plus one team bringing their own Vive; E14 3rd floor atrium - Very cool space with some couches that everyone can use to chill; E15-341 - Shared Vive Plus 2 teams bringing their own Vives; E15-359; E15-483; E15-3rd floor CMS area. Unless you are on a team with someone with an MIT Media Lab badge, they may have access to other space. If you have a question, please ask one of the organizers or volunteers. What if I have question about the Github? Please @Praveen or @Preethi on the slack channel or ask the registration desk. What are the some of the main project judging/evaluation criteria? User experience, innovation,	technical merit, impact/potential, sharing resource/collaboration,	artwork/sound direction, code commits, judges discretion etc. If I want to post about the hackathon, what are the hashtags I can use? Who should attend the hackathon? Attendees from all backgrounds, genders and geographies are welcome. We accept a wide range of applicants, from beginner programmers, to experienced hackathon veterans. Prior AR/VR experience is also not a requirement. How much prior VR/AR development or design experience is required to participate in the event? No prior experience is required! Any prior experience is always useful; however, we will have lots of helpful design, platform and vertical workshops for those who have not worked in VR/AR before and are looking to get involved. Who will own any IP produced during the Hackathon? All IP produced during the Hackathon is required to be registered in the public domain with no residual rights to the IP and available for public use. The spirit of the Hackathon is to encourage innovation and collaboration. We want any developments created during the Hackathon to be openly shared with other participants after the event to foster further development for the benefit of the greater good and to be available to the public to spread awareness and appreciation of the creations made during the Hackathon. Additionally, we would like to cut out the potential for any conflict resulting from the creations. We want people to partner and work with people they don't know very well and we want to avoid any potential for IP disputes or debates about who contributed what to the project and that is all alleviated by keeping everything open sourced. MIT also has IP policies regarding its students creations and we don't want to create any conflicts when working on a team with one of the many MIT participants. Lastly, IP protection often covers creations which are more fully developed. We expect that most material created over the weekend to be in a preliminary phase which may not be suitable for IP protection.. If you object to registering your work made during the Hackathon in the public domain with no residual rights, please do not participate in the event. Can we participate as a team in this hackathon? If yes, how can we form one? We prefer that you come as an individual and form a team with new people that you meet here! Last year, all the members on the winning team haven’t met each other before the hackathon. They created memorable experiences together and found lifetime friendships. It’s the spirit of the hackathon this year. All the members also have to register for the event individually. What if I come with a team? Split up and join a team where you can meet new people and become exposed to new ideas, create original work! The application did not include the option for team registration because the judges will value original work and original code over everything else. Teams leave hackathons with the same ideas with which they came. The best way to win with original work. The best source of original work is new ideas, enrich yourself and the hackathon by meeting new people. No problem, most participants will not. We will have time allocated on the Friday night of the event for participants to pitch ideas, introduce themselves and form teams. What do I enter in the affiliation field on the registration form? Please enter your current employer, university, graduation year etc. It is NOT to be confused with your hackathon team, which as explained above will be formed on the Day 1 of the hackathon. It's free, there are no fees to attend the event! You just need to cover your own travel and lodging. Food during the event will be paid for by us. Will there be any hardware/equipment available for project development? If you have any equipment and can bring it (desktops/laptops/monitors/HMDs), we would encourage you to bring it. We will have equipment from sponsors for participants who do not have any equipment or are unable to bring it, but the use of some items may be on a time-share basis if we have limited amounts (For example, we will only have a few HTC Vive headsets). The Media Lab is located on the Red Line at the "Kendall/MIT" stop of the subway. For more information on parking and public transportation please refer to their website. All attendees are required to bring a valid government ID (ex: driver’s license, passport) for admission. Also bring your laptop, and any hardware you wish to use in your hack. We will have sponsors loaning out tons of hardware as well! Is this an overnight hackathon? Participants are highly encouraged to work through the night however, the MIT Media Lab will only be open from 7am-1am Saturday and then will re-open again at 7am on Sunday. Because of building policy we have to close the hackathon during the night. There are Airbnbs and Hostels in Cambridge for participants to take a rest and refresh themselves. Will travel reimbursements be available for those who travel from out of the area? Is there a Travel Scholarship? The Reality Virtually Hackathon is free to participants so that the organizers can make the event as open and inclusive as possible. It is a non-profit event. We may have a few travel scholarships for students who cannot afford to travel to the hackathon. The requests for travel scholarships will exceed whatever funding that we will have and the scholarship grants will be very competitive. We will consider your request for a travel scholarship, but you should not plan on a scholarship to pay for your travel if you intend to participate.